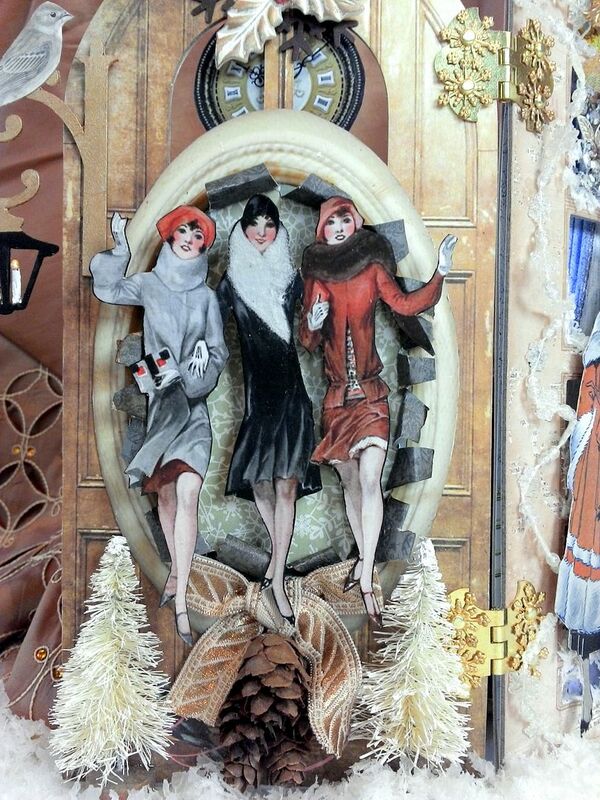 Here come sassy ladies in their fur coats and baby it’s cold outside! 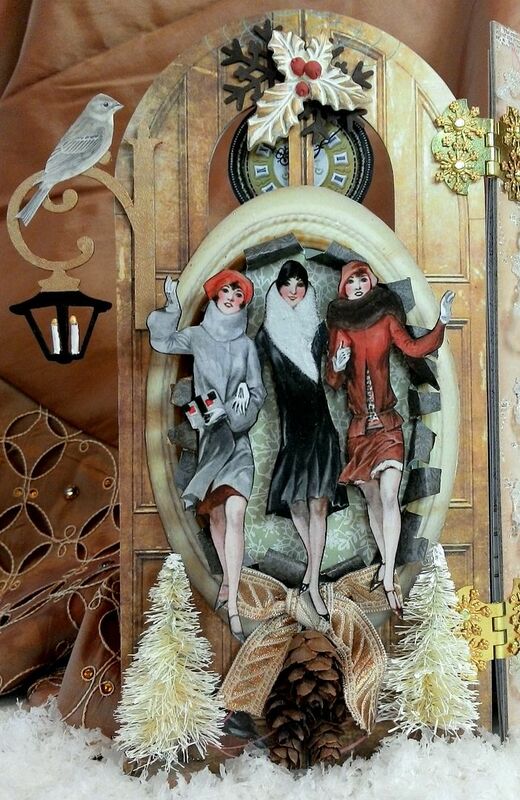 I imagined that these ladies are out shopping, meeting friends and having a great time in the wintry holiday weather. 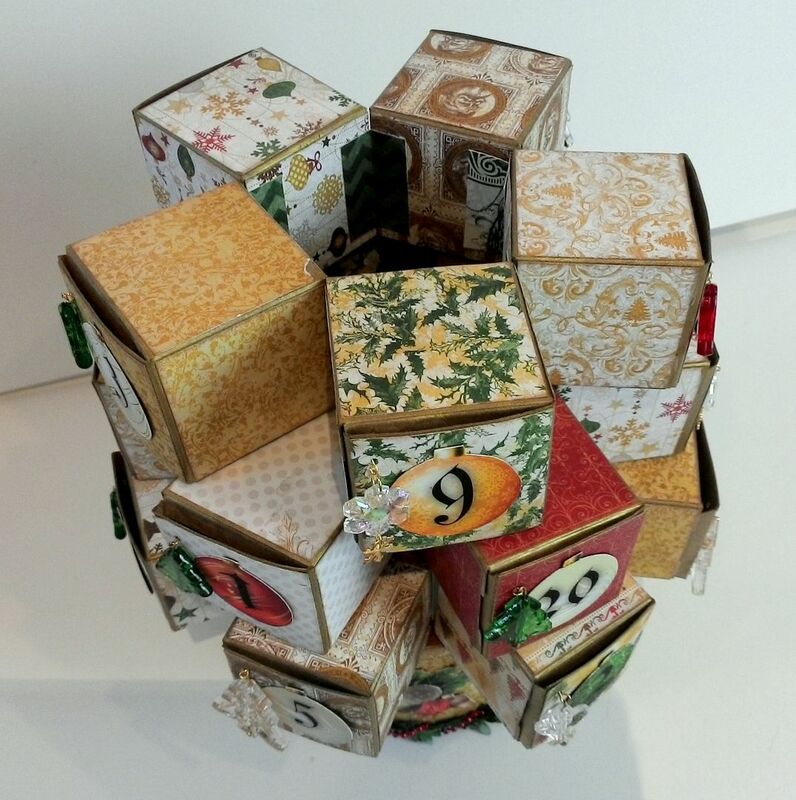 This piece is made from a door album with the pages hinged together to create an accordion folded display. I love using architecture for a backdrop. 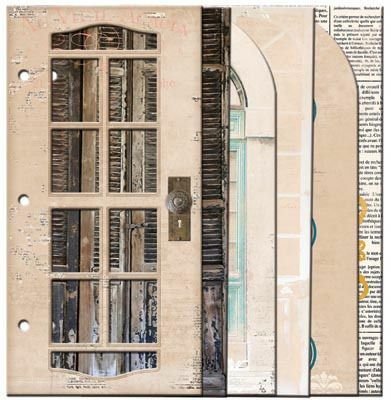 By hinging the doors together rather than assembling them as a book, it allows for the use of large dimensional embellishments, plus you can see everything at once. I’m thinking this would make a great display on a mantel piece or bookshelf. I also decided to go with nontraditional holiday colors and a design that was more winter oriented as I can image leaving this up beyond Christmas. I took my color inspiration from the door book and the Glistening 6 x 6 paper pad with its blue, grey, tan and cream color scheme; a perfect way to show off lots of snowflakes. This sheet is filled with 1920's women dressed in coats. Also included are snowflakes & birds. 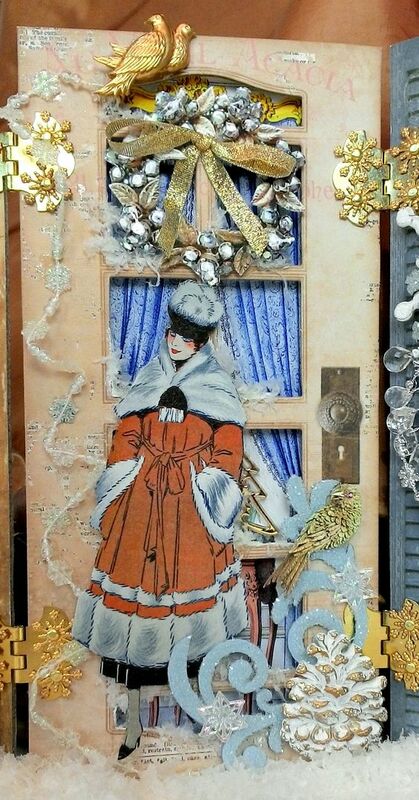 In addition to walking you through the construction and design of each of the doors, I will also cover how I created the paper embellishments. The size of each door is approximately 10’5” x 7.25”. The set comes with six doors and each door has a different design on each side. My first challenge was to choose the sides I wanted to use for the front and to narrow it down to 5 doors (I like odd numbers). Next, I laid them out in order and marked the placement of the hinges. Using paper weights helped keep the doors from shifting as I marked the holes. I placed the hinges so that they covered up two of the three holes in each door. I used embellishments to cover up the remaining hole. I punched the holes and attached the hinges to the doors with brads. 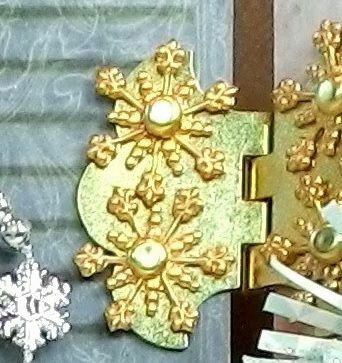 To dress up the hinges I added a brass snowflake charm to the brads (before inserting them into the holes). I only added the charms to the brads that would be seen after all of the embellishing. The bulkiest embellishments I used were bottle brush trees. 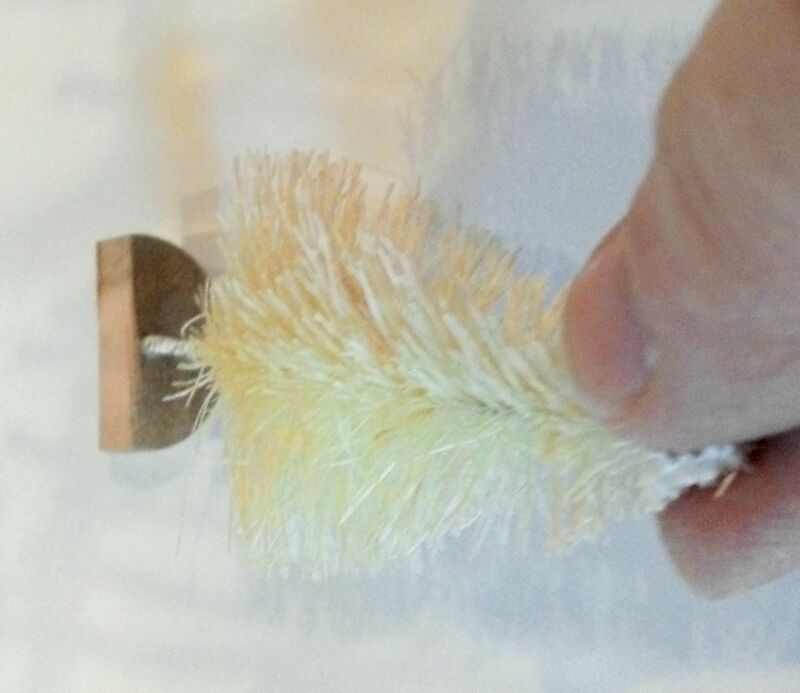 Before attaching them to the door, I cut away almost half of the base and the bristles on the back of the tree. These mods allowed the trees to sit flush against the door. To make the ladies pop, I used a frame and paper cutting technique. First, I resized and printed a frame from my Antique Frames digital image set. 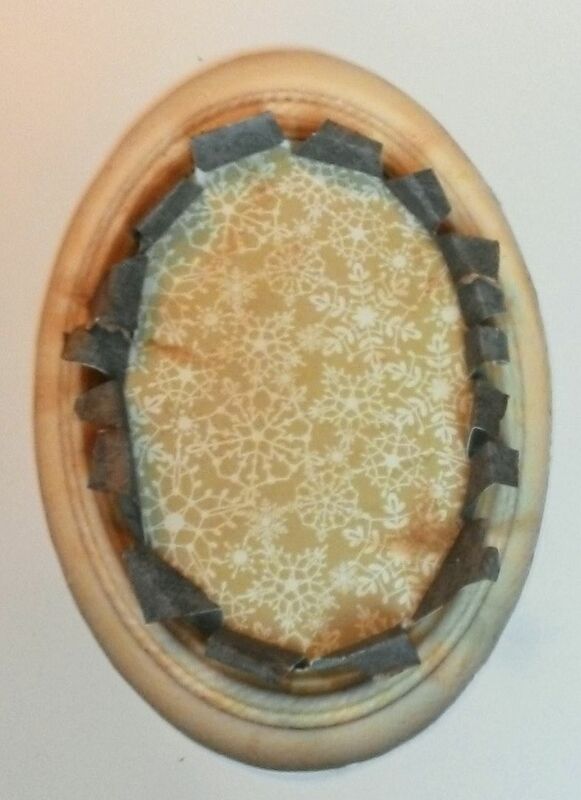 The frame is round in shape but I enlarged it and stretched it into an oval. 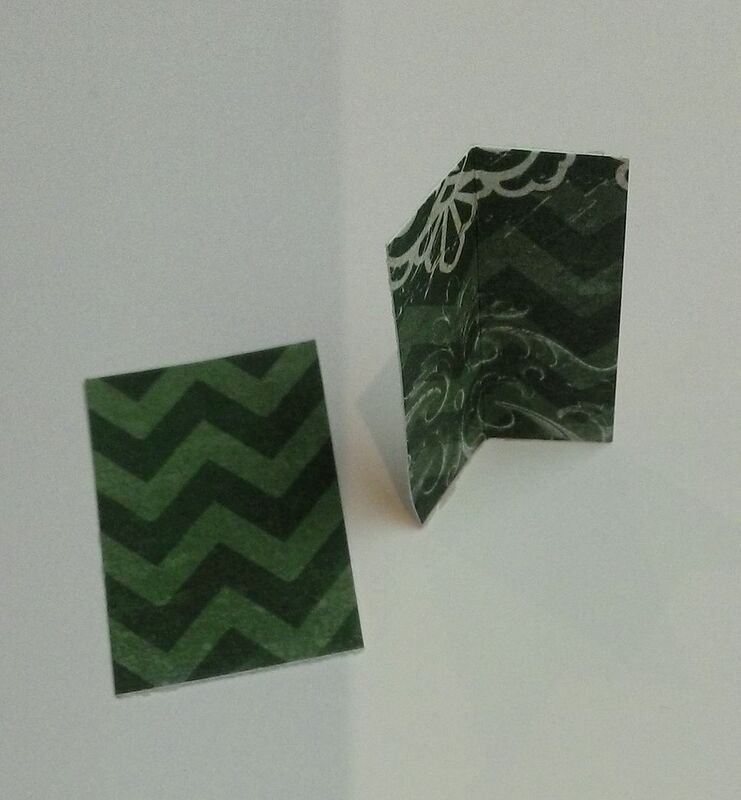 Next, I cut two different pieces of pattern paper from the Glistening paper pad. 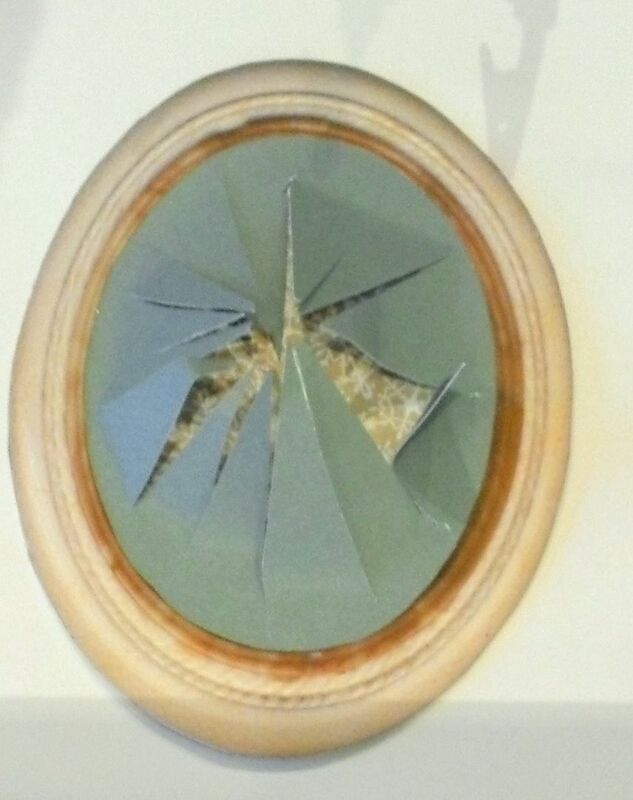 The pieces are slightly smaller than the frame. 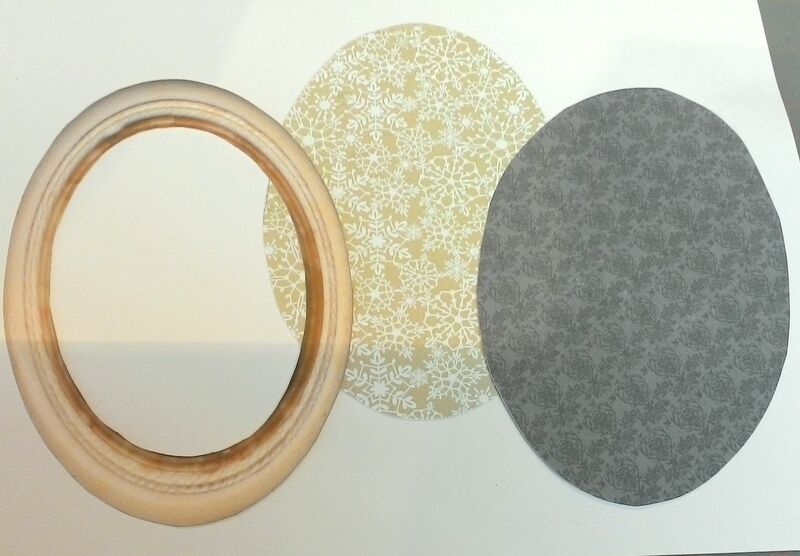 One piece serves as the background (tan and white snowflakes) and the other serves as the piece that curls out of the frame (blue grey snowflakes). 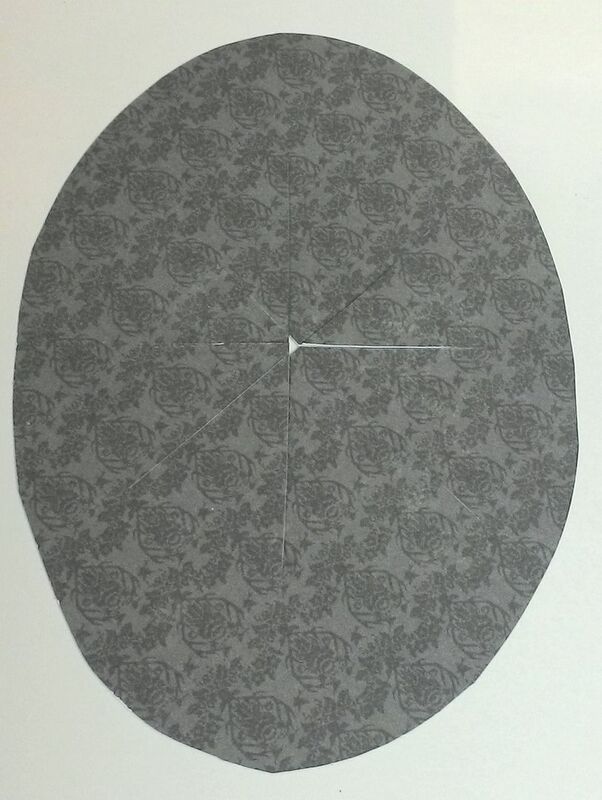 Using an X-acto knife, I precut lines in the center of the blue/grey paper to facilitate tearing. Only cut the center section of the paper and not towards the edge where the fame will cover the paper. Next, I flipped the blue/grey paper over and glued it to the tan/white piece. Glue only around the edges of the paper. Glue the frame to the paper. Tear back the pieces of the blue grey paper. Tear off the excess at the ends and curl the paper over the frame. I also inked the edges of the paper. Now the frame is ready to attach the images of the ladies. 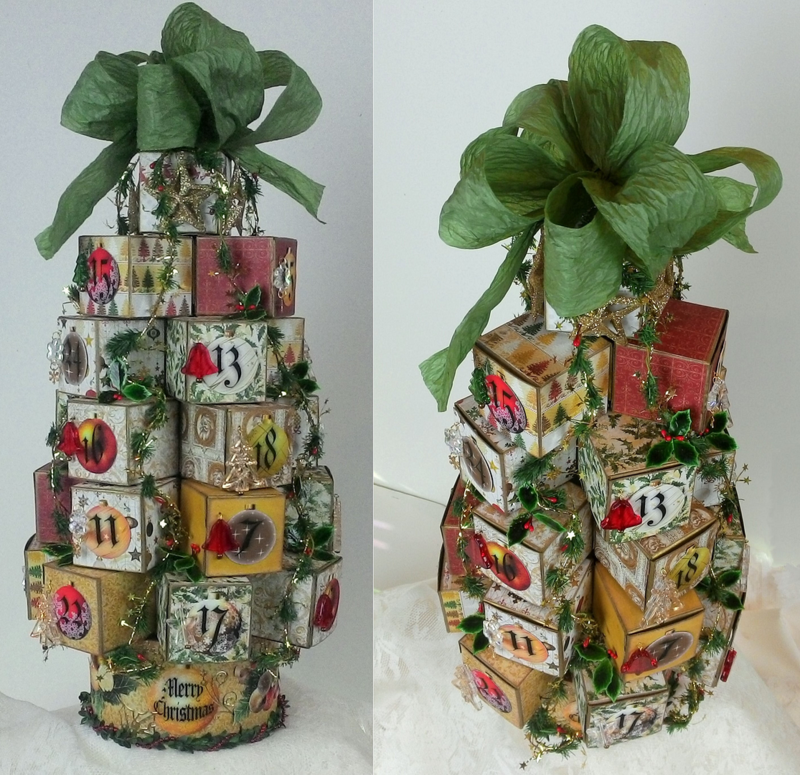 I finished dressing up the piece by adding the miniature pine cones and ribbon. Also notice that this door has openings cut in the top which allowed me to attach a clock to the backside of the door. This was one of my favorite doors because so much of it is cutout. On the backside of the door I attached a scene of blue curtains and a table. On the table is a Christmas tree. 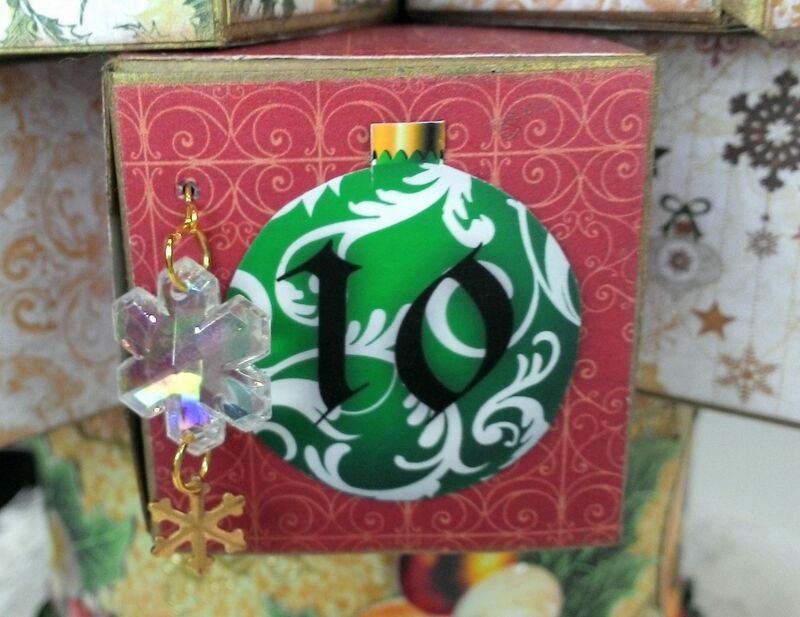 This is one of the tree charms you saw me use for the Advent Calendar project. I used foam core tape on the window scene to separate it from the door adding depth and creating space to accommodate the tree charm. The swirls at the bottom are painted blue then coated in Twinklets Diamond Dust (one of my favorite products) using Glossy Accents. 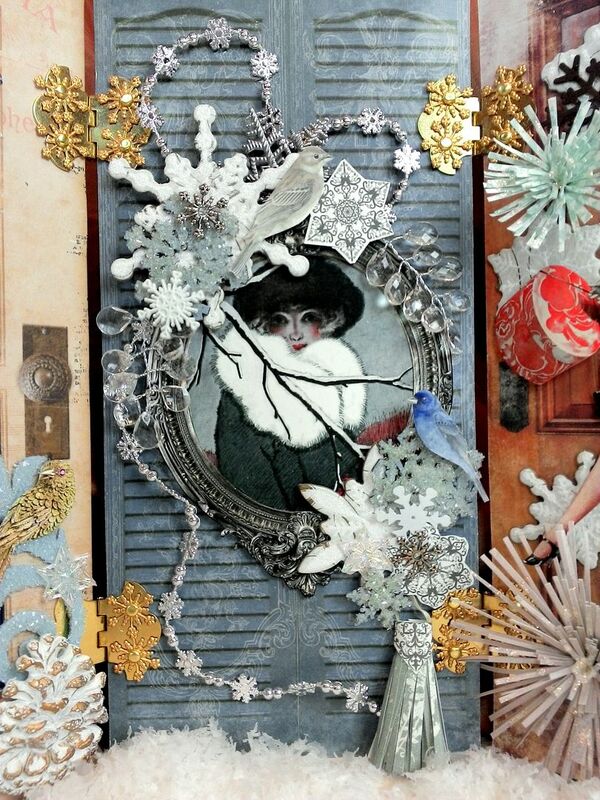 The wreath and gold bird at the bottom are from my Bejeweled collage sheet. I added depth to the jewels in the wreath by applying Glossy Accent. 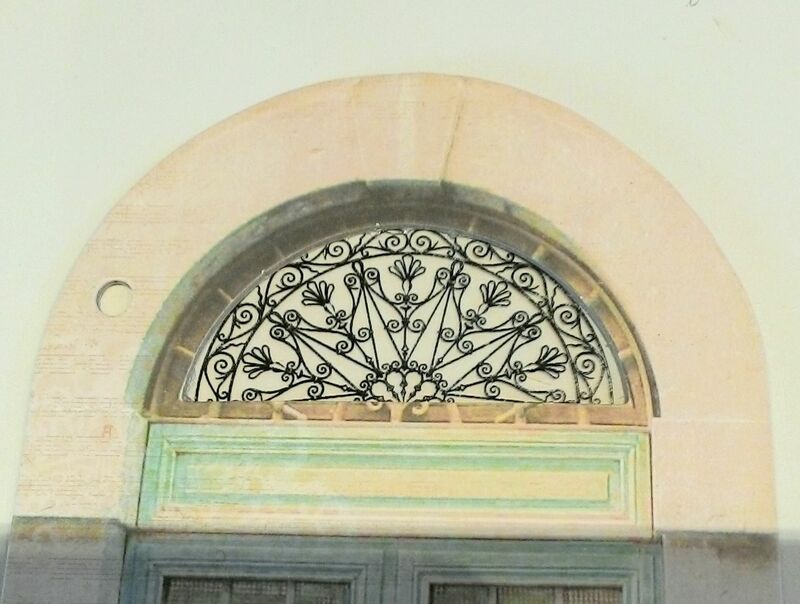 Of all of the doors this one is probably my favorite design. I think it is because of all of the snowflakes. 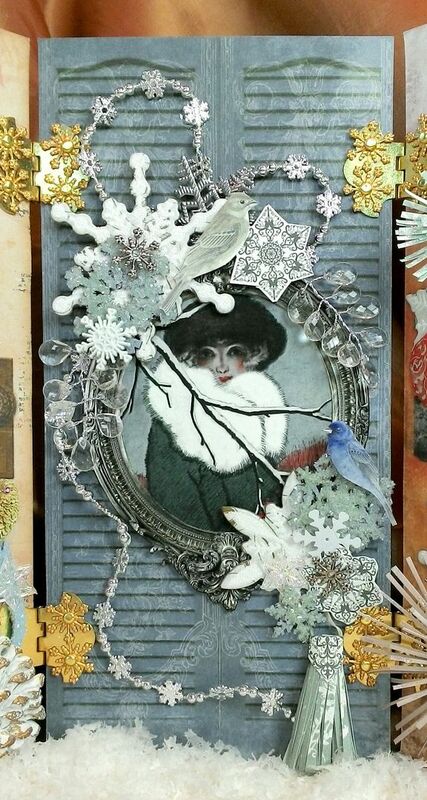 Some of the snowflakes and the birds are from the new collage sheet. 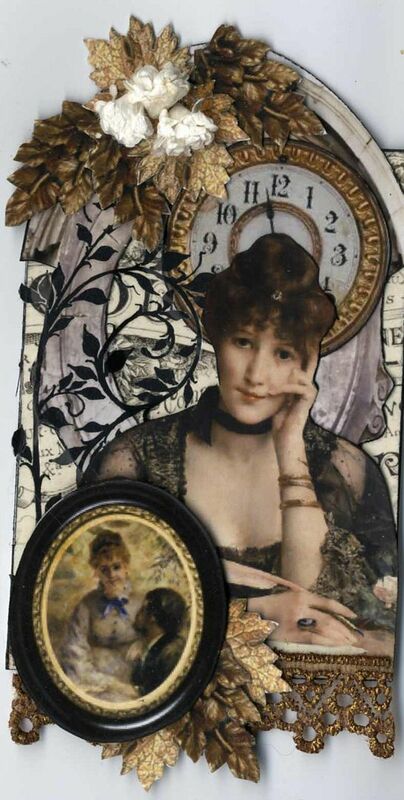 Again I’ve used a frame from my Antiques Frame Digital image set to accent this lovely lady. One type of snowflake I used was made from chipboard. I painted the snowflakes blue and coated them in Diamond Dust (using Glossy Accents) to give them sparkle. The tassel at the bottom is one that I made from the paper pack. 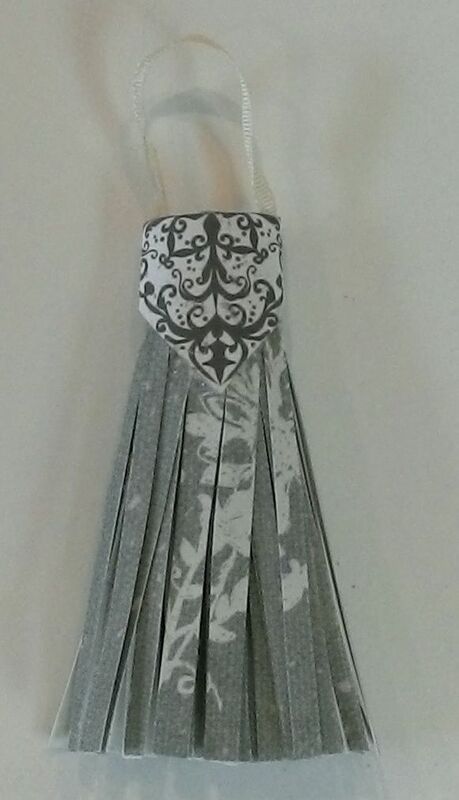 Below is a quick video showing you how to make a paper tassel. 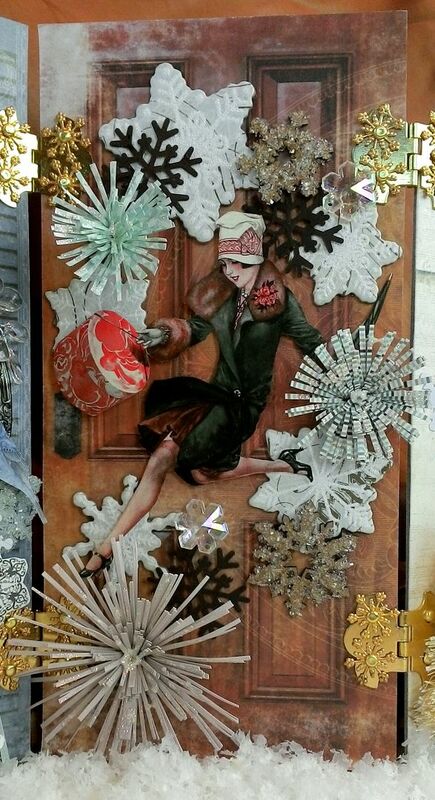 I attached several different types of snowflakes to this door including the paper snowflake sprays before attaching the image of the lady with the hatbox. 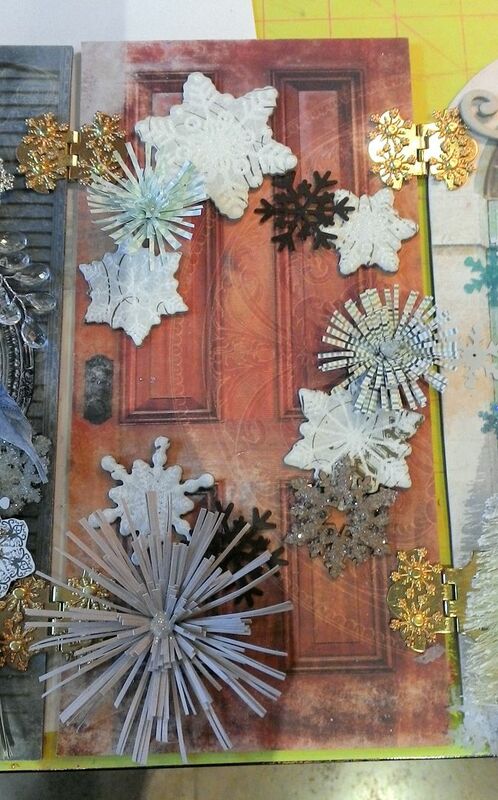 After attaching her, I added more snowflakes to finish the door. 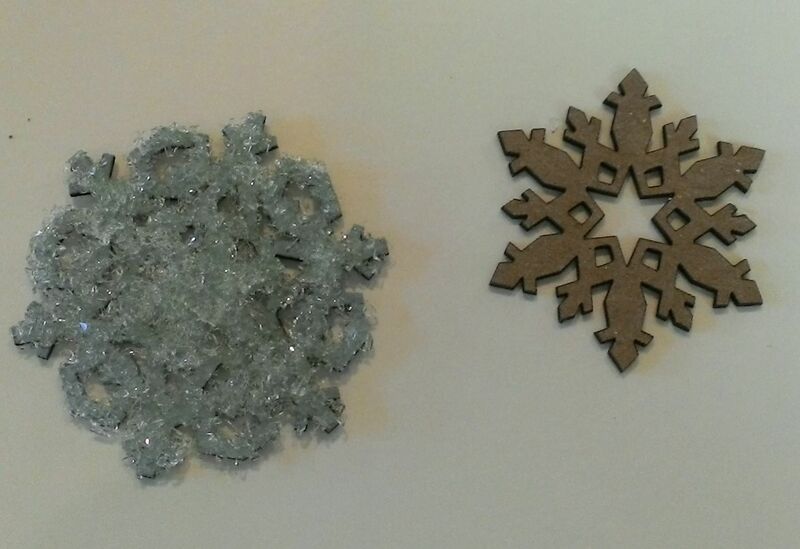 The snowflake looking sprays are made from paper. Below is a short video on how to make them. This is probably my favorite door as I love its color and style and of course the cutout at the top. 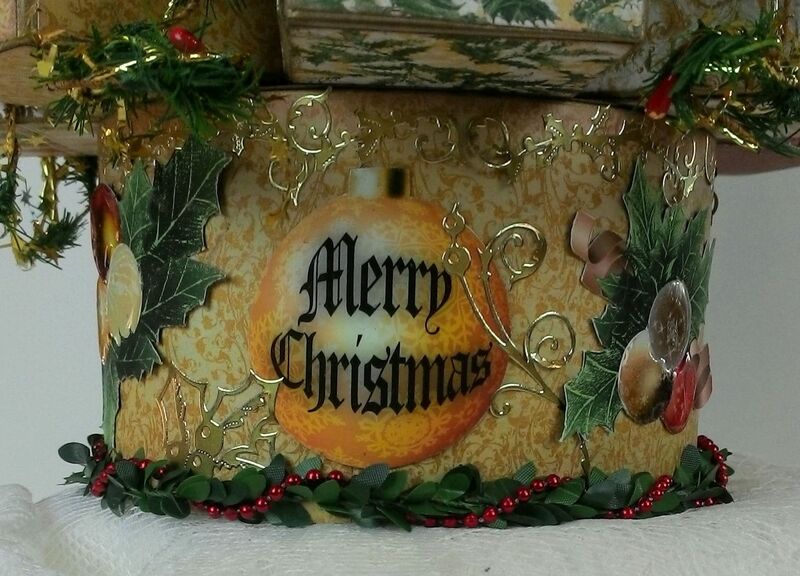 The sassy lady sitting on the hatboxes in the snow is perhaps waiting for someone to come home and let her in? To this door and the first door I attached chipboard lanterns. The candles in the lantern are made from beads and the flame is yellow paint. 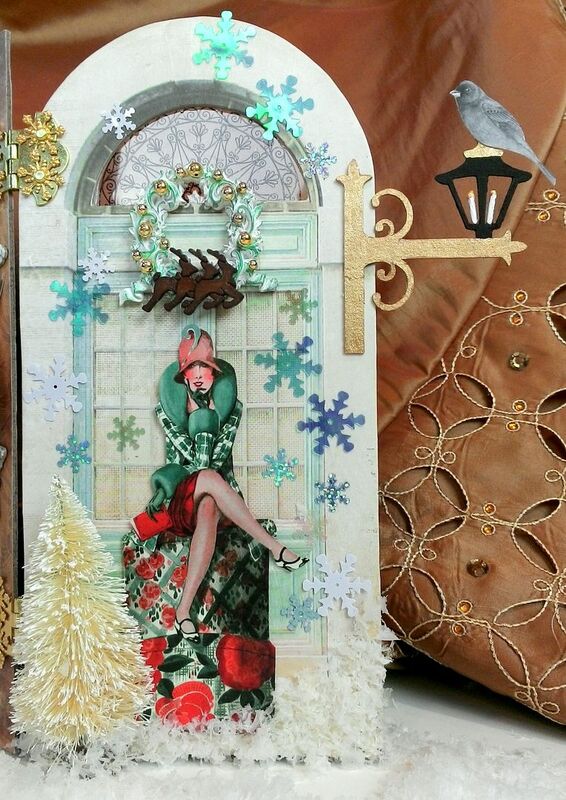 The snowflake sequins are attached using Glossy Accents. I used my finger to apply paint to the raised areas of the wreath and attached gold beads and a reindeer button. On the backside of the door behind the cutout I attached the grill work piece that came from the transparency. I hope you enjoy this project and stay tuned for more seasonal project ideas and tutorials. I am so behind on posting some of the art pieces I made this past summer. With the big carnival event for Halloween and then jumping right in to fall and winter art I've been crazy busy the last few months. The overall size of this piece is 5" x 2 1/2". 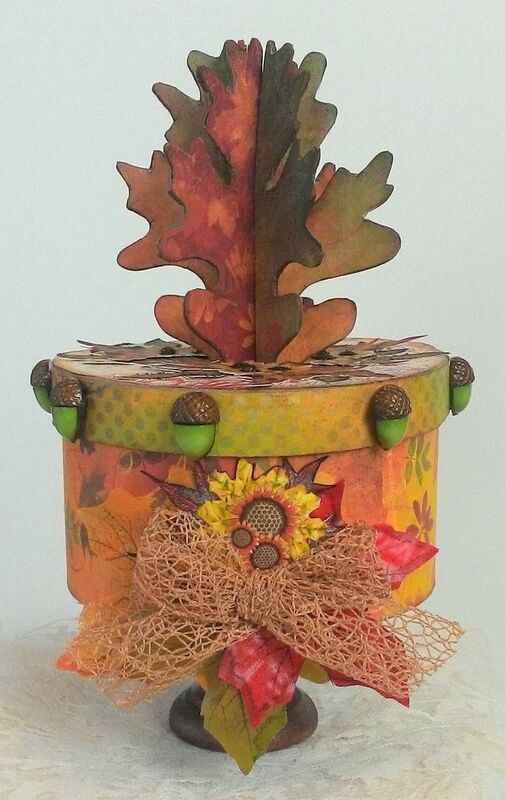 How about decorating a round paper mache box in a fall theme and using it as a treasure box or as part of a centerpiece. 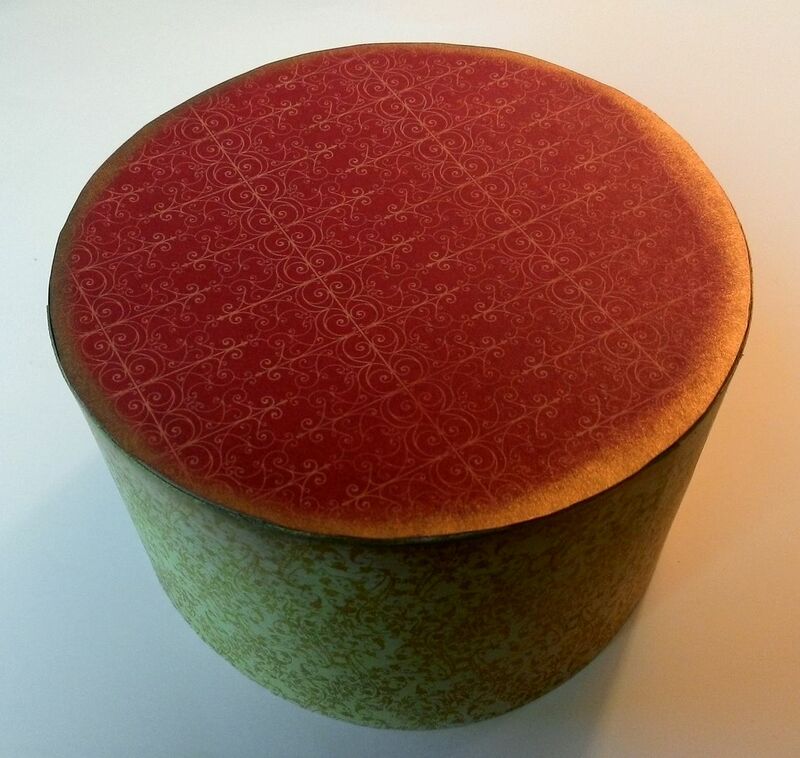 The topper is made from 3 chipboard leaves that serve as decoration and also as a handle to lift the lid from the box. 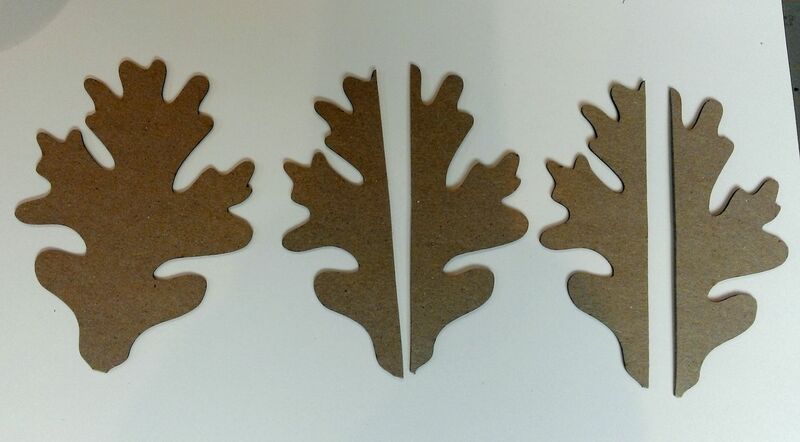 Although I used leaves, you could use this technique for lots of other chipboard shapes. First, paper or paint your leaves. The leaves below are undecorated as they are just for demonstration purposes but you will want to decorate yours first. When papering items that don’t have straight edges I use sandpaper to help remove the excess paper. Cut two of the leaves in half. I inked the edges of the chipboard after they were papered and cut. Because the stems of the leaves are so narrow, I cut them off. Depending on the shape you are using you might want to cut something off of the bottom of the shape if it is narrow like the stem of the leaves. Paint or paper your box lid. Mark three cut lines at the center of your box lid as pictured below (of course yours will be papered and or painted) and use an X-acto knife to cut the lines. This is where you will be inserting the leaves into the box lid. The length of your lines depends on the shape you are using and how far you want to insert the shapes into the box lid. 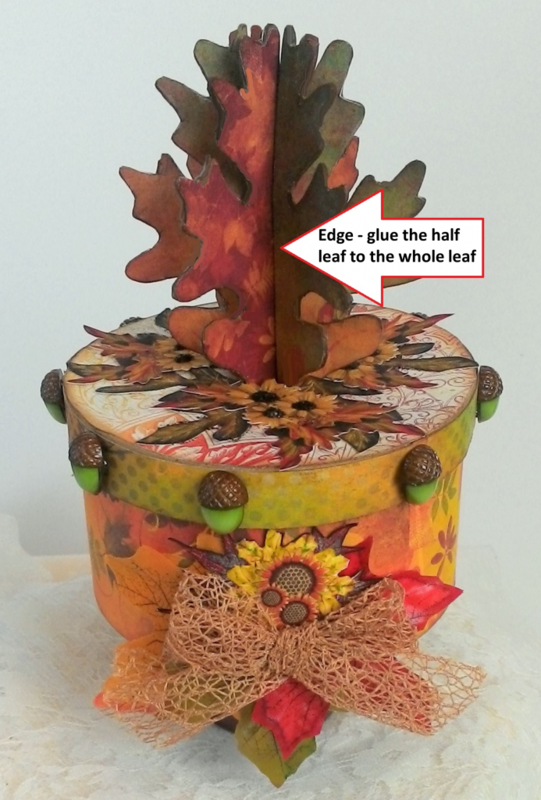 I inserted the leaves I used about 1/2” into the box lid. Insert the full leaf first. Next, insert a half leaf and glue it the full leaf where the two meet. Continue inserting and gluing the half leaves. You are reassembling the cut leaves with each other but with the full in between. Note: when working with a shape like the leaf where each side of the leaf is not exactly the same, make sure that when you glue the half leaves in place you are gluing each side of the same leaf across from each other and in between the full leaf. 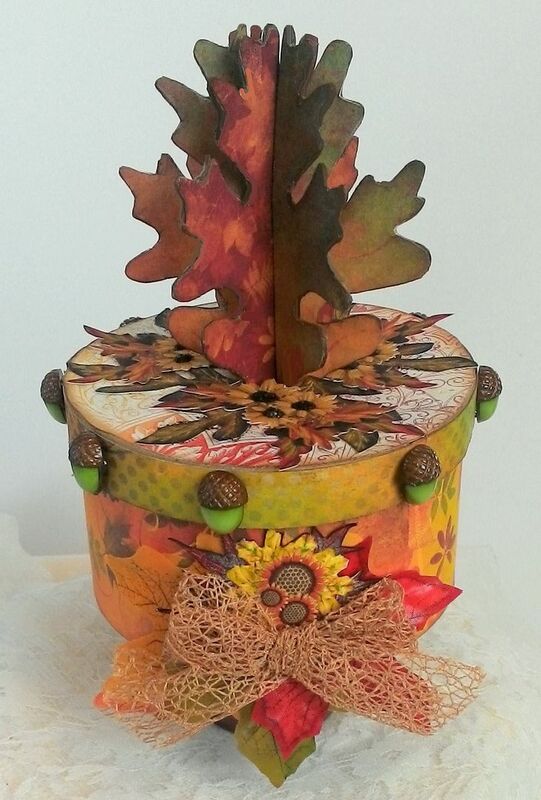 Once all of the leaves are in place and the glue has dried, you might want to add a little glue to the part of the leaves that are inserted in the box (inside the lid) to keep them from being pulled out when you use them to lift the lid. 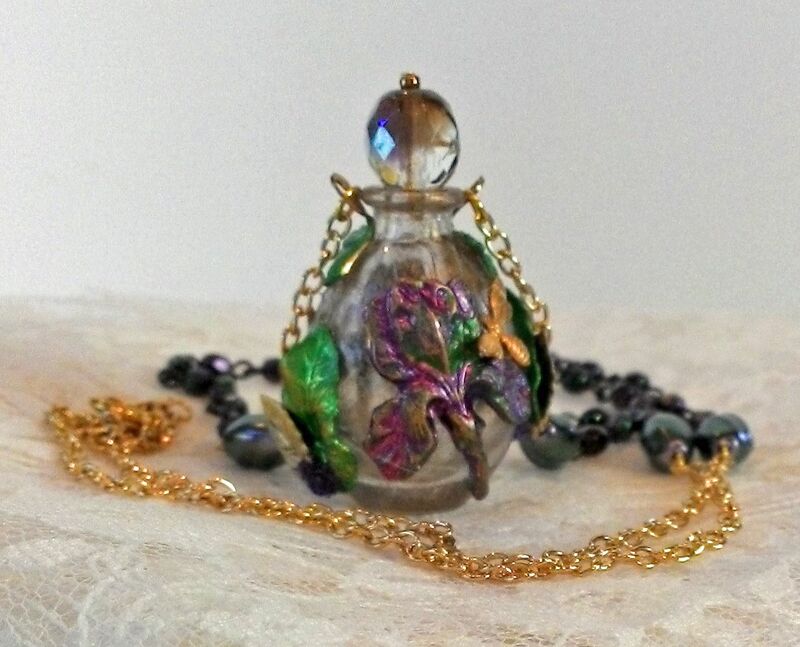 I have another altered bottle to share with you and this time it is a perfume bottle necklace. My friend Betty gave me a bunch of fabulous mini perfume bottles. 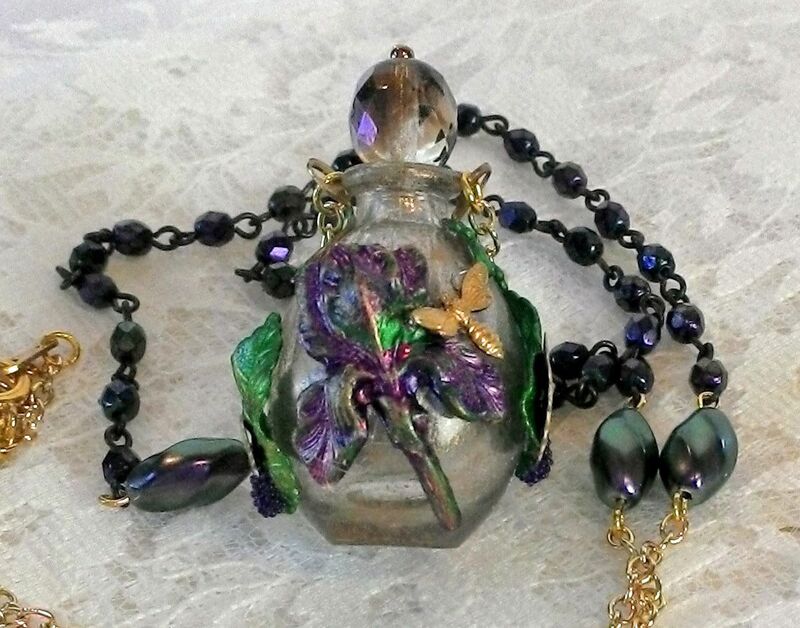 To thank her, I’ve make her this necklace out of one of the bottles. Just like the fall bottle in my previous post I used Gilder’s Paste (Inca Gold) to color the glass. The brass flowers and leaves are colored with combinations of Ranger Metal Patina Paints and accented with microbeads. This is a project that has been sitting around forever waiting to be finished. The inspiration came from the pine cone stopper which I found at Crate and Barrel about 3 years ago. It’s a Christmas ornament which was only 99 cents and when I saw it I thought what a great stopper it would make. The pine cone is covered in microbeads. I colored the gold brass leaves with a combination of Patina & Copper Gilders Paste and Ranger Patina Metal Paint (the color is Amethyst). I bent them some to make them wrap around the bottle. I also added something called “Dazzlers” to the bottom leaf. They are like glitter but a little larger. I purchase them from the Glitter Art Institute who makes all kinds of fabulous glitter products. The copper leaves and swirls are metallic copper sticker. You’ve seen me use the gold and silver versions on many projects. 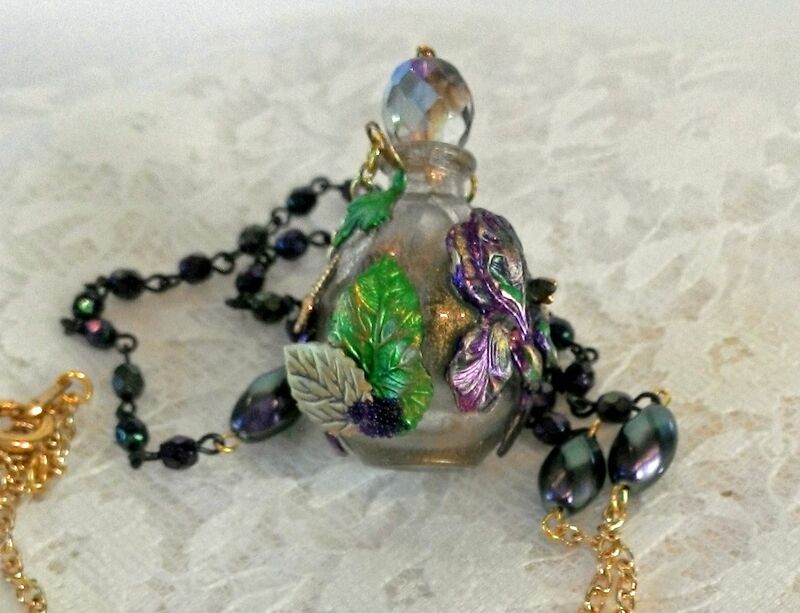 Around the bottom and the neck of the bottle are beaded trims. 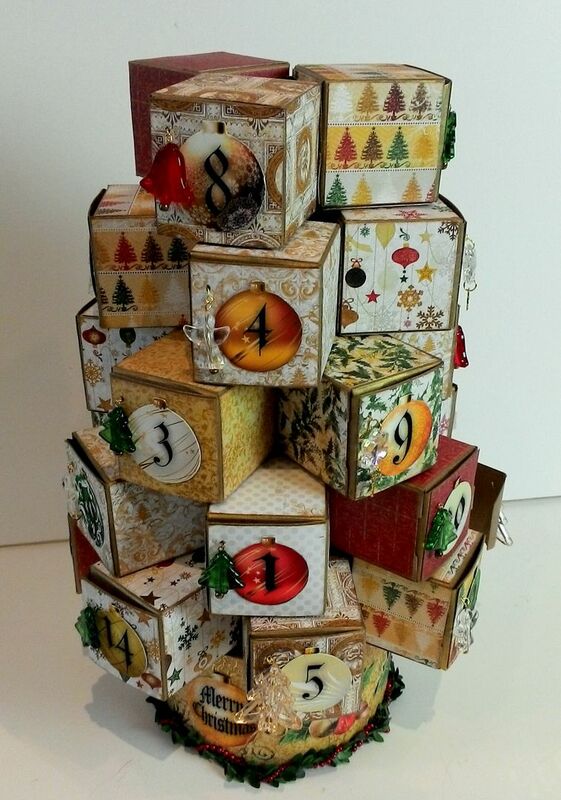 Just in time for this Christmas season is a fun festive Christmas Tree Advent Calendar project. 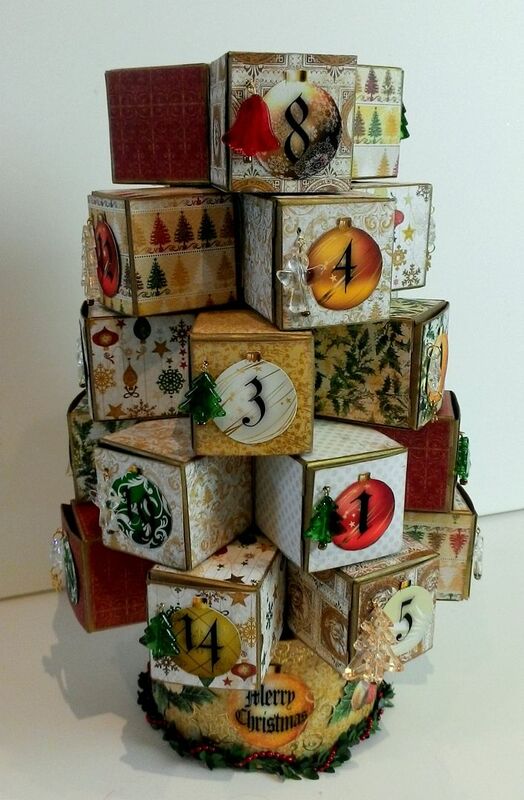 Last year I showed you how to make an Advent Calendar out of matchboxes and this year it’s out of chipboard boxes. 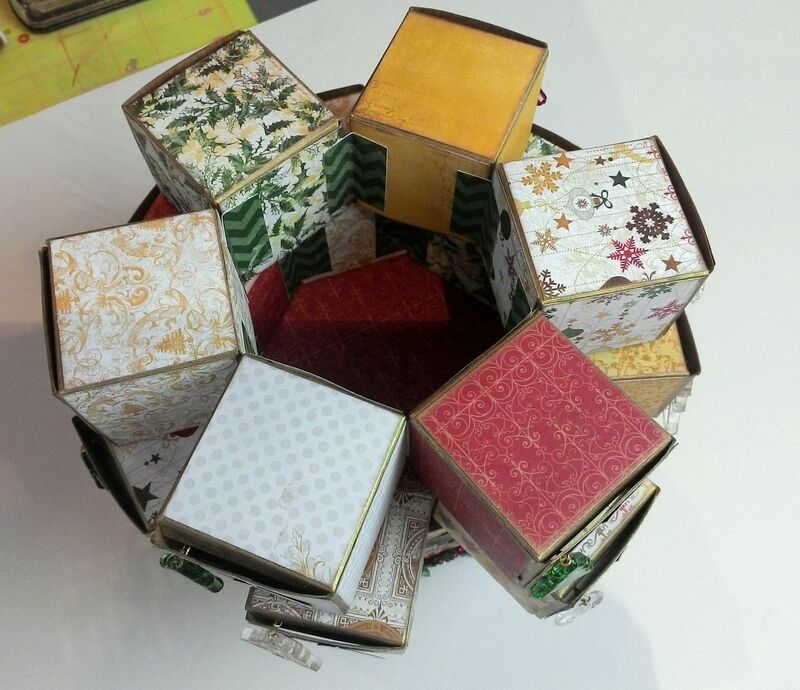 The boxes are a 2”x2”cube, which gives you lots of space to fill them with goodies. The overall size of the calendar is 19” tall (with ribbon) and 9” wide. In addition to the tutorial below, I have created a companion collage sheet and digital image set. 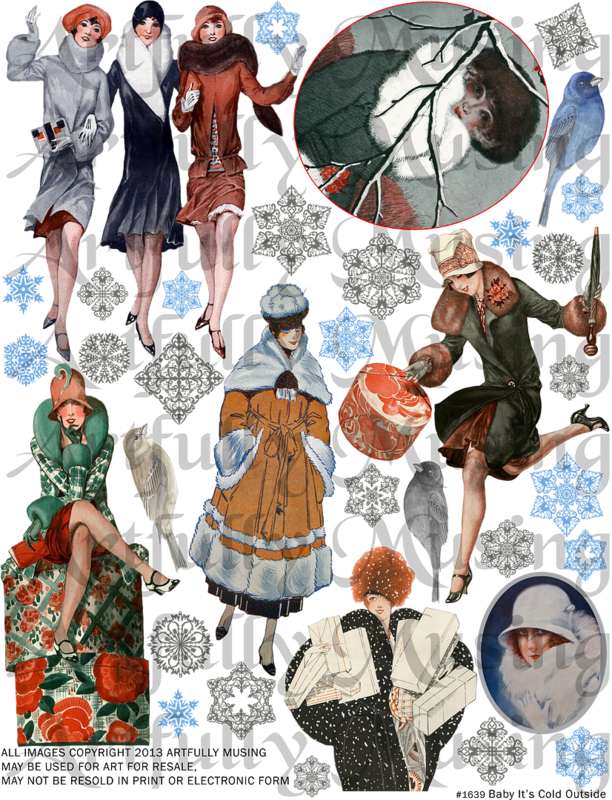 The Digital Image Set includes all of the images in collage sheet as well as the ornaments without the numbers; making them useful for other Christmas themed projects. For the base, I used a paper Mache box. This comes from the same set of boxes you saw me use in the Halloween Carnival projects. The boxes come in sets of 3. I used the large one which is 5 ½” x 3”. Paint or ink the edges of the box. I used a gold stamp pad to ink the edges. You will be using only the bottom of the box and not the lid. Embellish the sides of the box. 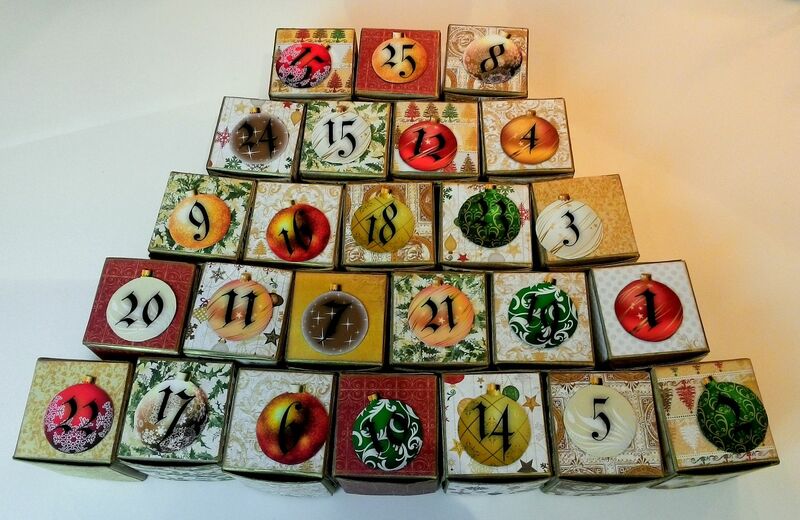 I used images from the Advent Calendar Collage sheet to decorate the box. To make the Christmas ornaments look more dimensional I added Glossy Accents. I used metallic stickers to bring in a touch of gold. Around the base of the box, I added Mini Pine & Berry Garland that I braided with Tiny Red Tree Garland. 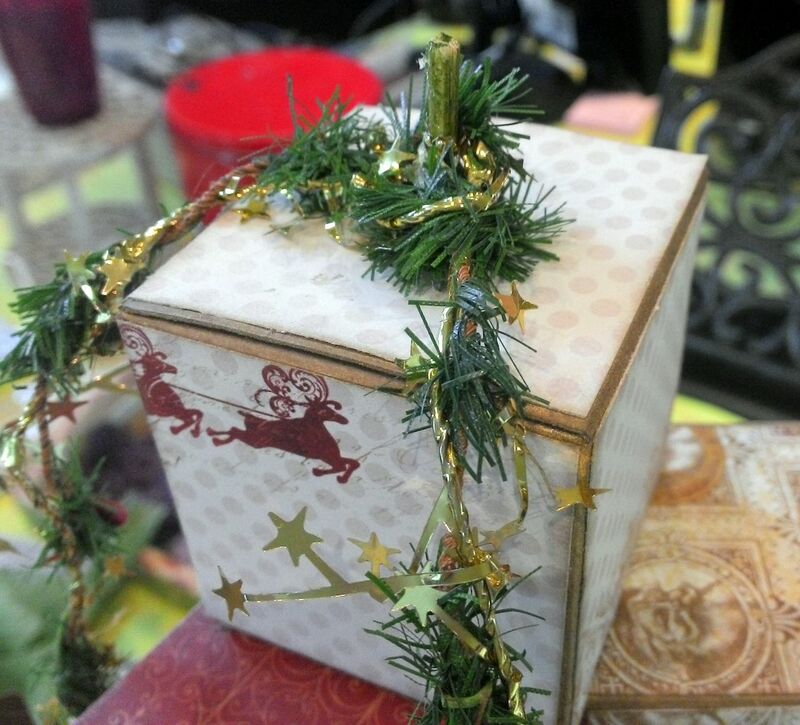 I used E6000 glue to attach the garland to the box. The pine garland is wired so it was easy to braid with the red bead garland. 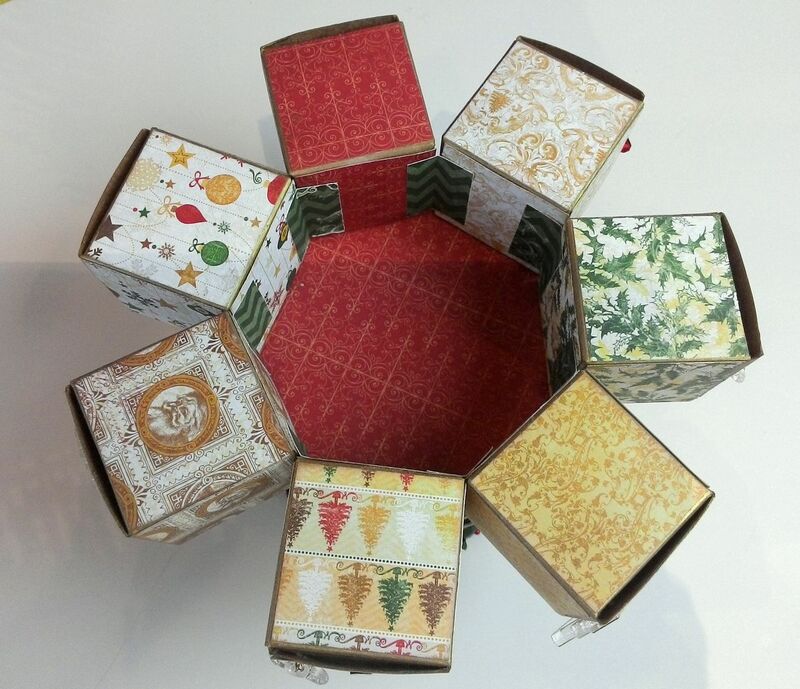 To create a tree shape you will be assembling circles of boxes. The boxes are 2 inches square. Each circle will have one fewer box then the circle before it. 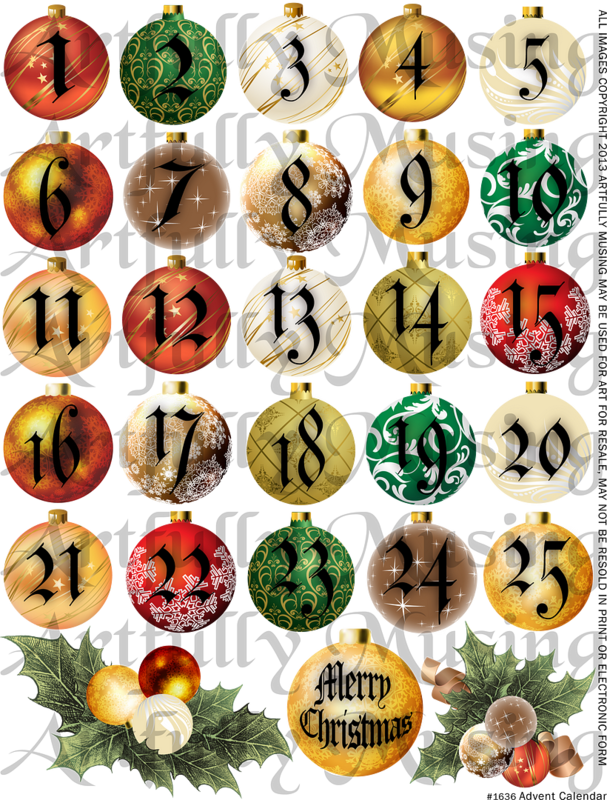 The tree is made up of 5 circles with 7,6,5,4, & 3 boxes; adding up to 25 boxes corresponding to 25 days. 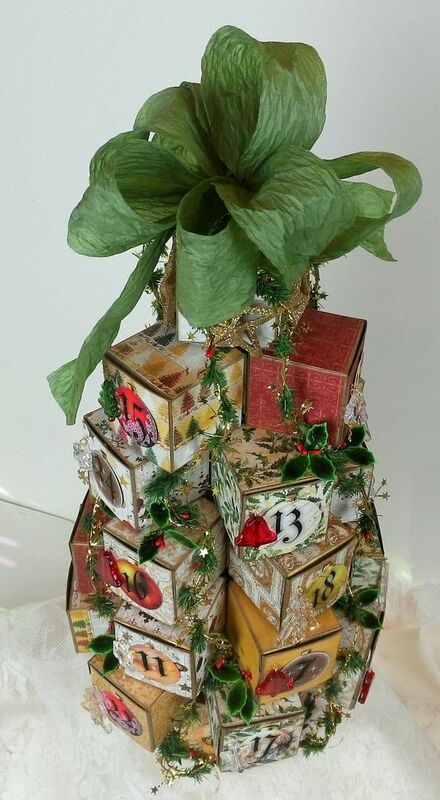 An additional box on the top makes the tree look symmetrical and accommodates attaching garland. Assemble 26 boxes. 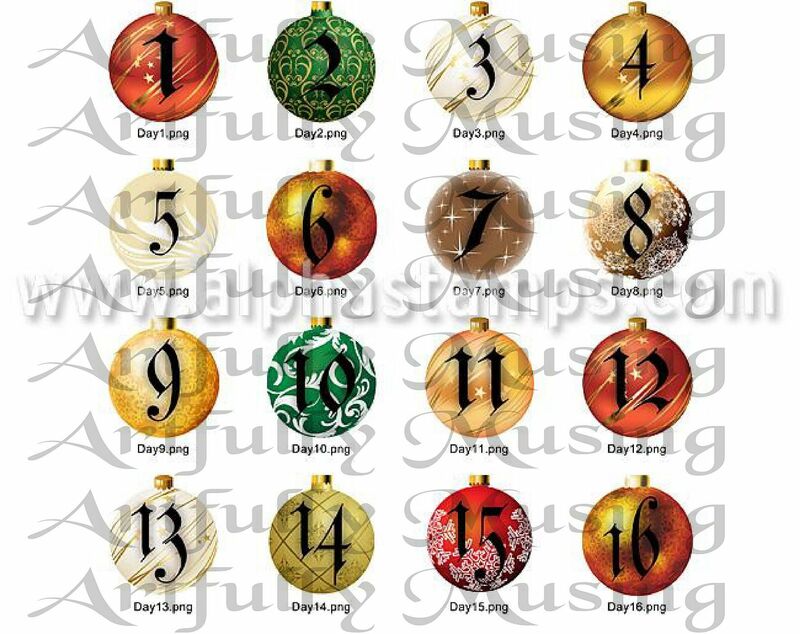 25 for each day and one for the top of the tree. Ink or paint the outside edges of the boxes. I inked the edges with a gold stamp pad as it coordinated with the papers I used. I also inked the main tab on the lid with the gold stamp pad. Paper all 6 sides of the boxes. 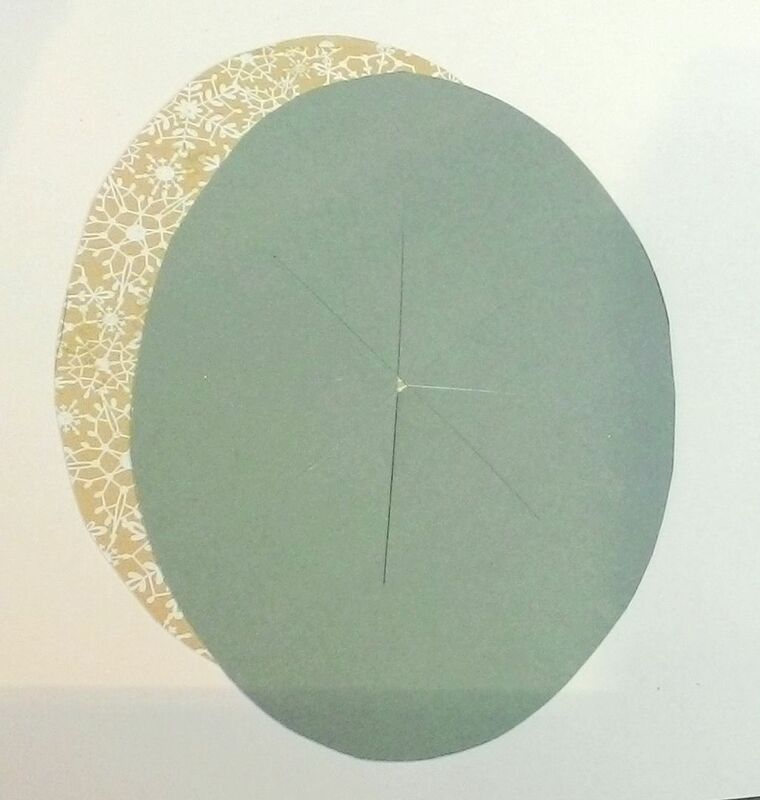 I cut pieces of paper that were 1 15/16” x 1 15/16” so that you would see just a little of the gold inking on the edges. Before attaching the paper, I laid out my boxes in order to make sure the patterns in the paper would be randomly distributed throughout the tree. 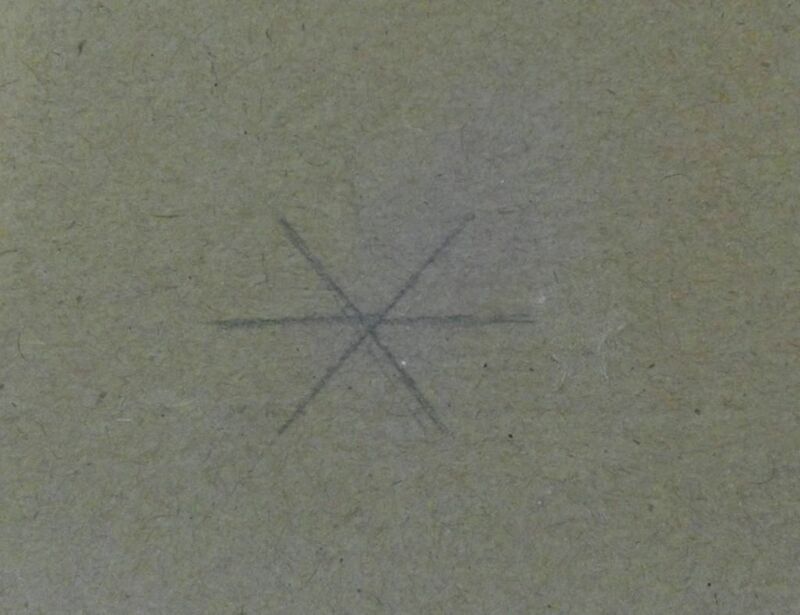 If the paper has a pattern with a direction, keep that in mind as you glue the paper to the boxes. I inked the edges of the paper before gluing it to the boxes. Optional – Paper the insides of the boxes. I decided not to paper the inside as I felt that the color of the box worked well with the papers. Decided which way you want your boxes to open. They can be all the same or different. I choose to have them open from left to right (since I’m right-handed). 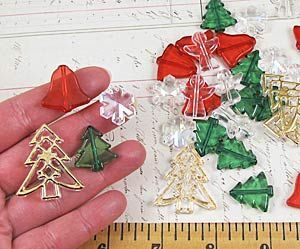 Once you have your boxes papered, glue the Christmas Ornament Days to the lid of each box (if you are using my images). 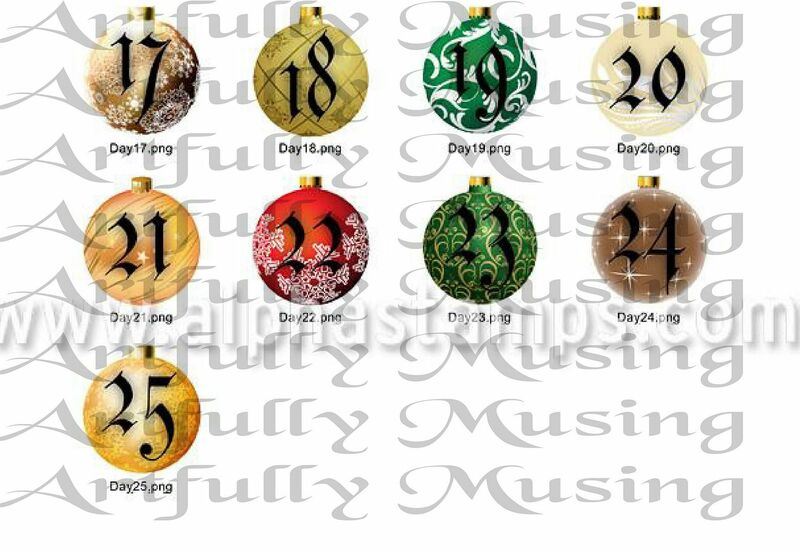 Just as with the papers I decided to randomly distribute the days on the tree. Of course, you could choose to put them in order. Also be mindful of the direction you want your box to open so that the ornament day image doesn’t end up going in the wrong direction. I laid my boxes out in order with the lids facing the correct direction and decided on the order of the days before attaching the images. I used Acrylic Christmas Themed Beads that coordinated with the paper. 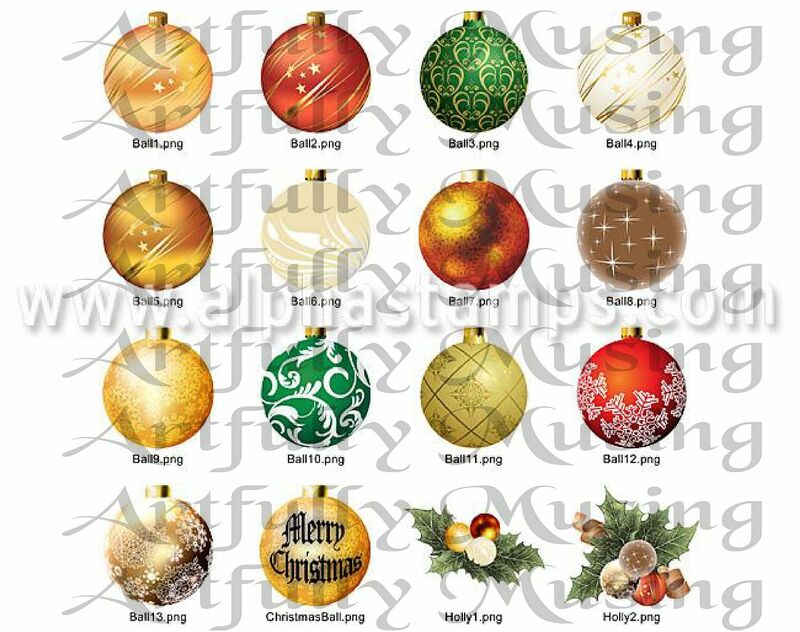 There are five different shapes (2 different trees, an angel, a bell, and a snowflake). I jazzed up the snowflake bead by adding a brass snowflake. I attached the beads using a headpin and eye pin. To determine the placement of the beads I took into consideration the length of the bead and where the inside tabs were located. The reason for considering the inside tab is that when you loop the eye pin to keep it from pulling through the lid, it creates bulk in the back of the lid. If this bulk is where the tab the lid won’t completely close. 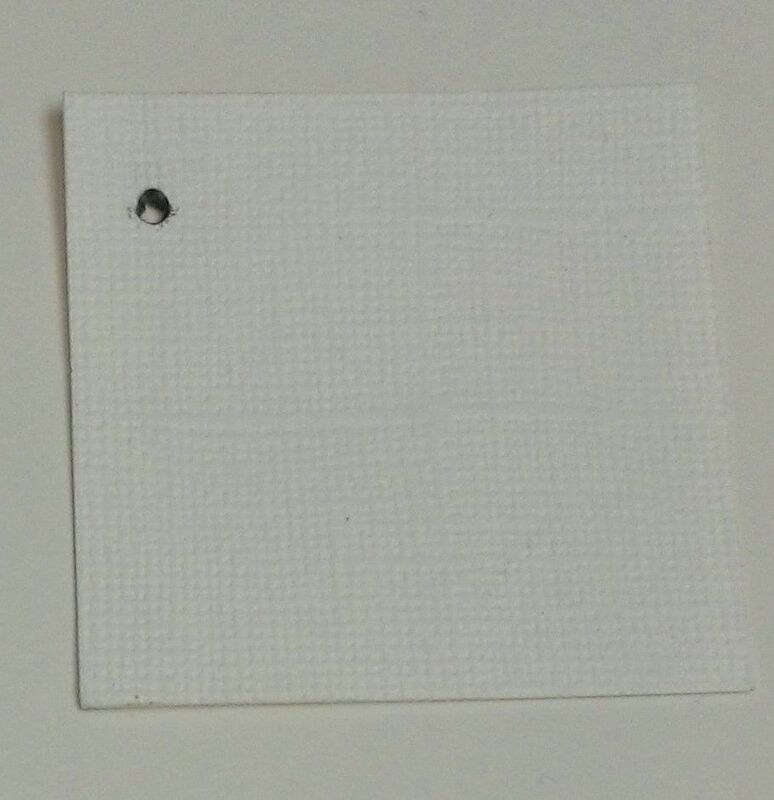 I created a template with a hole so that I could consistently mark the bead placement for each box. Cut 25 pieces of paper 1” x 1 ½” long (I used paper from the paper pad). I would recommend using cardstock as it is a bit sturdier and has color on both sides. Score and fold the pieces of paper long ways down the middle. These pieces of paper will be used to connect the boxes together. 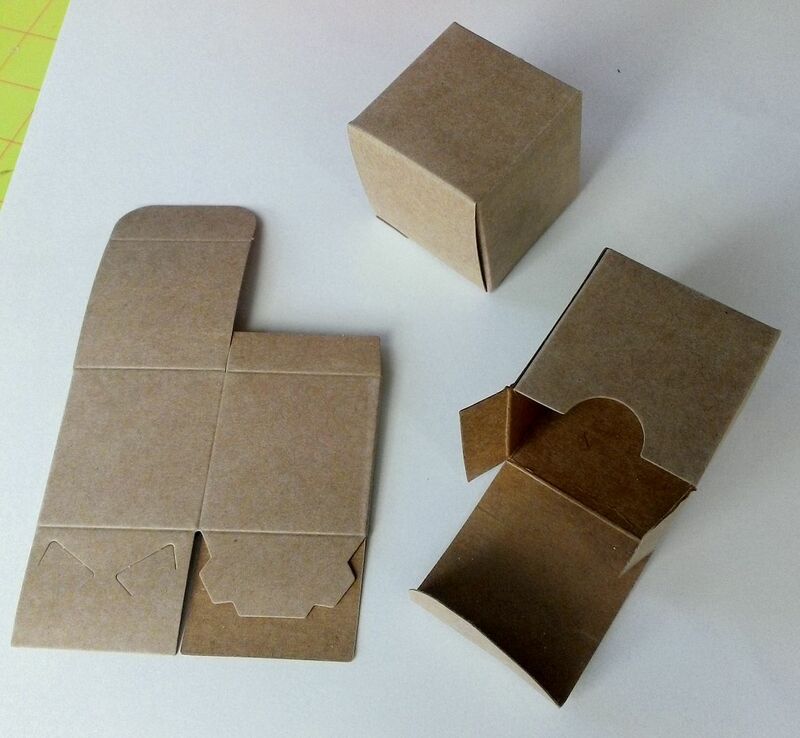 Use the paper piece to glue together 7 boxes. 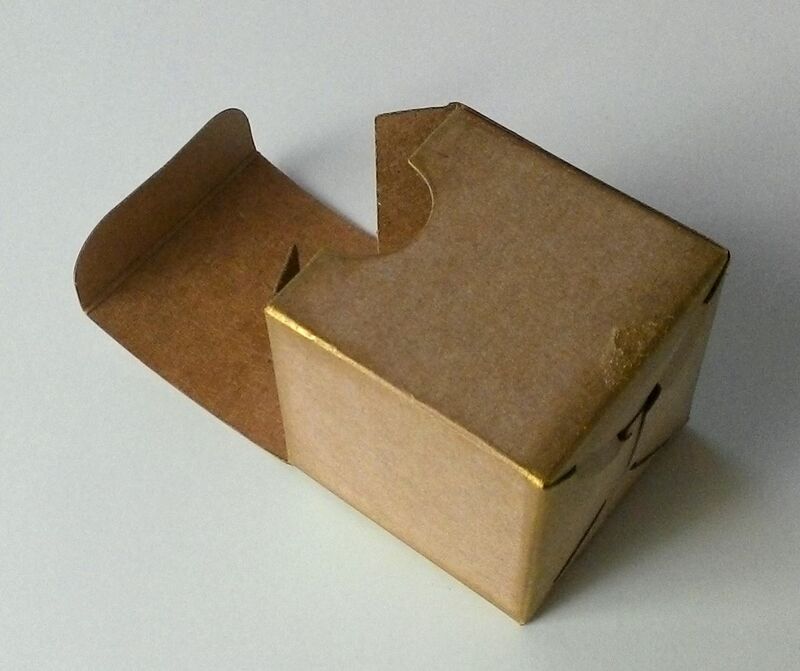 Attach half of the paper to the back edge of one box and the other half to the back edge of another box. Continue until all 7 boxes are connected into a circle. Continue connecting boxes into 5 rings with each ring having one fewer box. 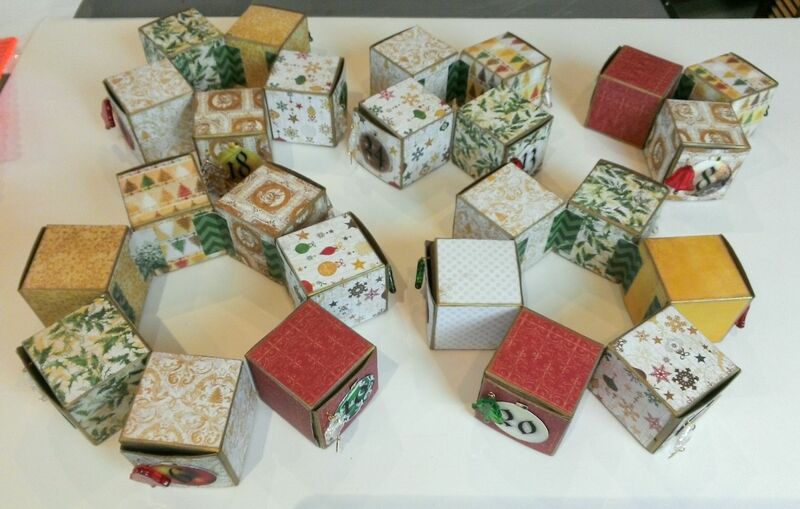 You should end up with rings of 7,6,5,4, & 3 boxes; adding up to 25 boxes corresponding to 25 days. 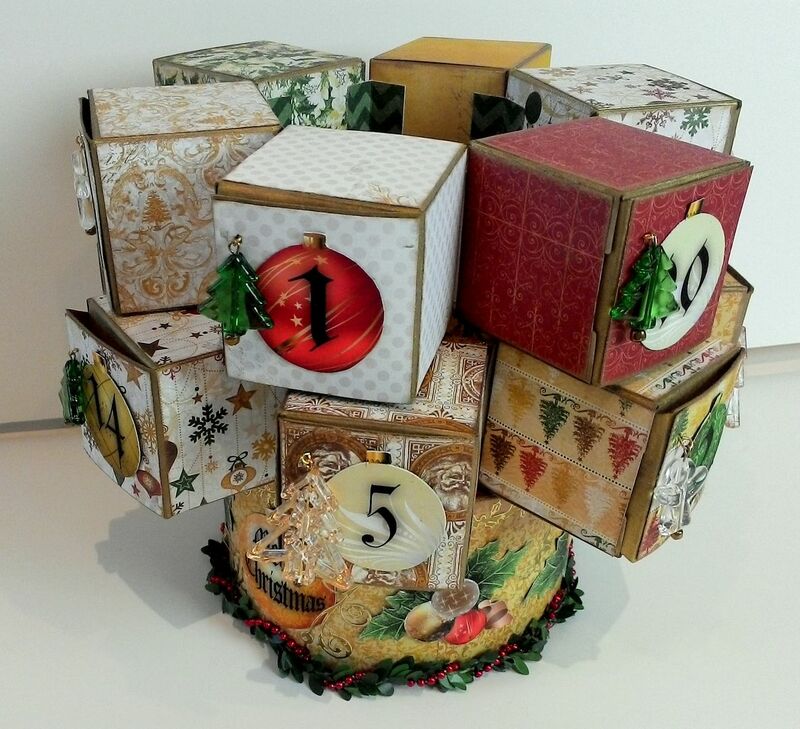 Use an additional box on the top to help make the tree more symmetrical and to accommodate hanging the garland. 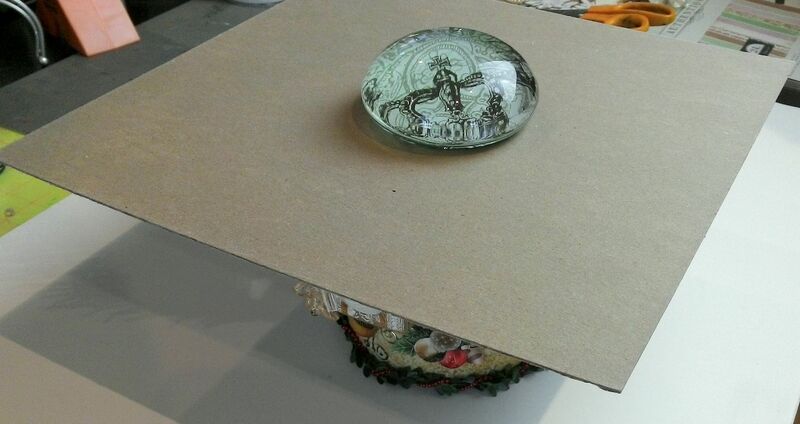 Glue the 7 box circle to the top of the base. Center the circle on the base. 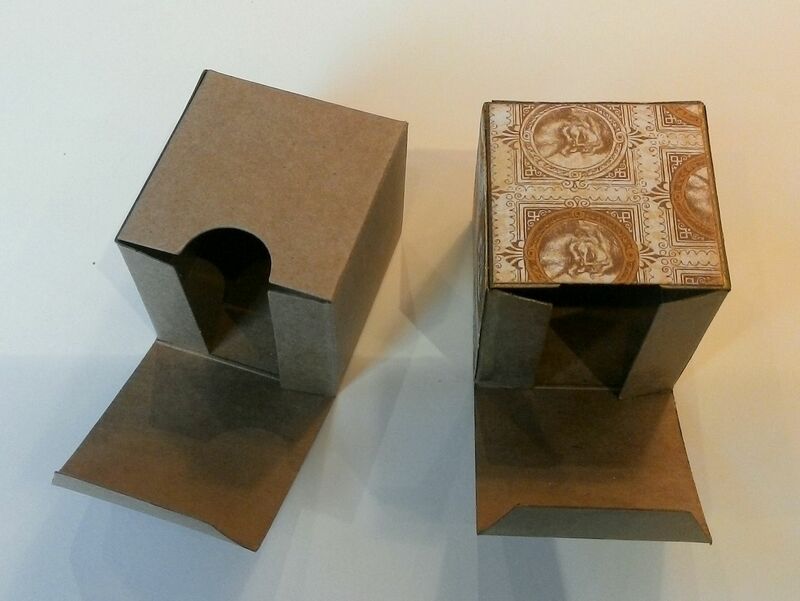 Even though the boxes are connected with the paper they are still flexible enough to adjust until they are centered on the base. 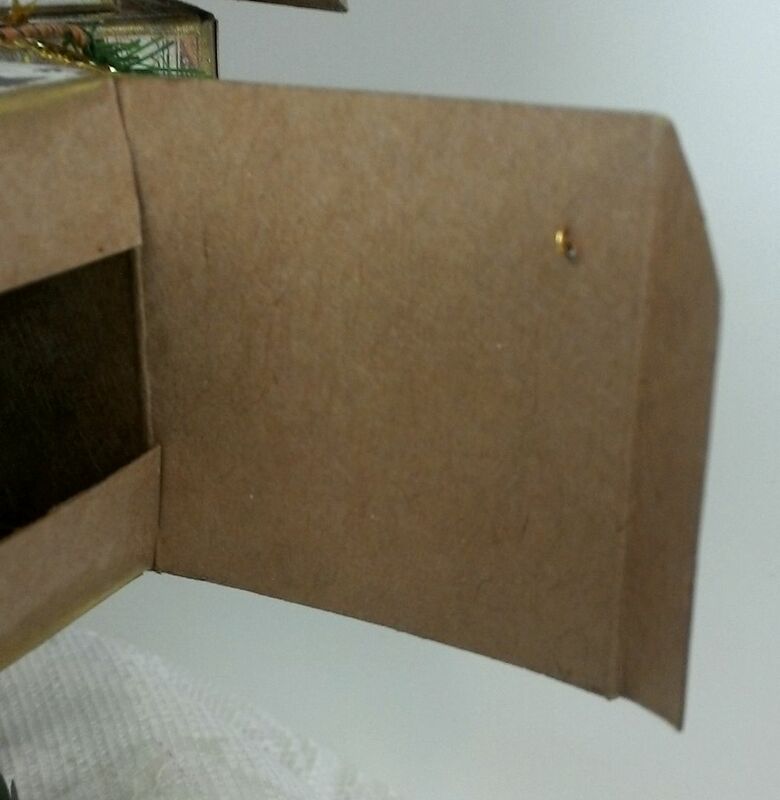 Once you have the boxes centered on the base I recommend adding some weight to keep them in place while the glue dries. I used a piece of chipboard and a paperweight. Next, glue the 6 box circle on top of the 7 box circle. Again apply weight to keep the circle in place once you have it where you want it. Since each circle has one less box than the last circle you will need to adjust each circle so that it is in the center of the previous circle. The boxes will not line up but sit slightly shifted to one side or the other of the circle of boxes below. Continue adding each circle of boxes to the next. The last and 26th box goes on the very top. I covered it with paper and glued the lid shut. I glued a small wooden skewer into the top of the box. The skewer gave me a way to anchor the garland. The garland is actually two different garlands; Mini Pine & Berry Garland and Gold Star Tinsel Garland. Both garlands are wired so it was easy to braid them together and bend them as they cascade down the tree. 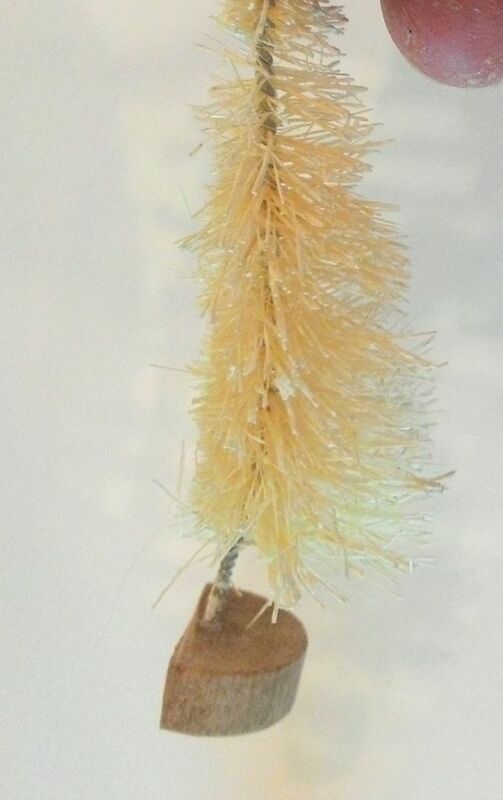 I made a loop with the garland at one end and glued it onto the wooden skewer using E6000 glue. Once I had the garland in place, I topped the tree with a Green Crinkle Paper Ribbon. The ribbon hides the wooden skewer. I draped the garland down the sides of the tree, bending and gluing it at various points on the boxes using E6000 glue. I draped it down the tree rather than wrapping it around as it would have blocked the box lids. I also added Lacquered Holly & Barry clusters to various boxes. 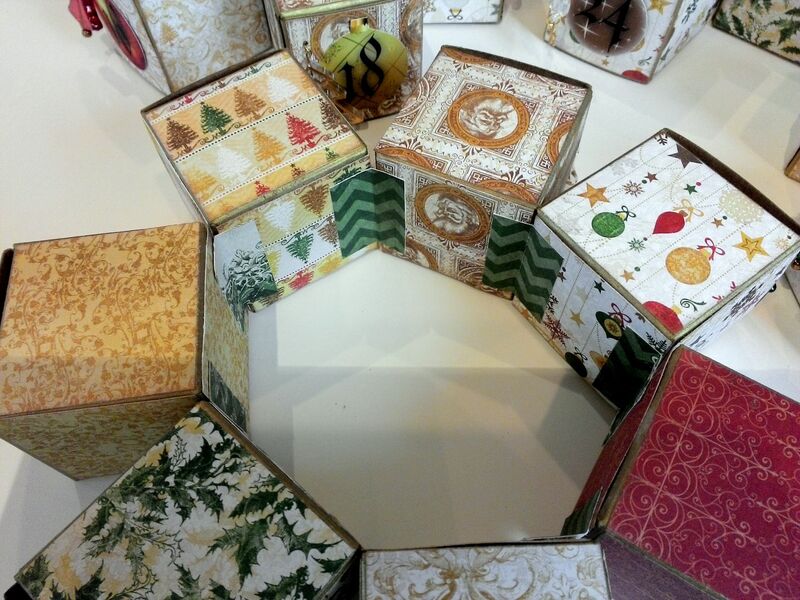 This particular assembly of the boxes gives you lots of ledges on each level of boxes to add embellishments. 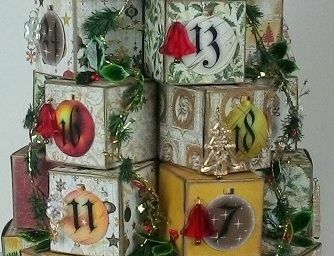 Have fun making a Christmas Tree Advent Calendar! !